Star brite® is the marine industry's leading manufacturer of waxes, polishes, cleaners, teak finishes, motor oils, fuel additives and more. Because Star brite® is run by avid boaters who test every item on their own boats, only the latest technology and highest-quality ingredients are used. As a result, all Star brite® products are the best they can be, instead of "just good enough." The company's state-of-the-art manufacturing and distribution facility supplies products to virtually every country on the globe. Every Star brite® product, from boat waxes, cleaners, teak finishes to fuel additives and more are all formulated to deliver maximum performance and value. They are made using the finest ingredients and latest technology such as nano-polymers, special chelating agents and enzymes. Wherever possible, every product is formulated to have minimal environmental impact; many are biodegradable, containing highly-effective agents that won't harm our waters. Additionally, many of the containers are also biodegradable, representing a first for the marine industry. Every Star brite® product undergoes rigorous testing to make sure it is good enough to wear the Star brite® logo. 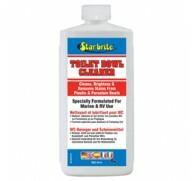 You can be assured that every Star brite® product is absolutely the best it can be.